So…I had PLANNED to write about the purpose and privilege of prayer to get this little blog series going on the basic Christian disciplines. I had PLANNED to post this weeks ago! However, the start to our summer has not exactly been about slowing down, resting and recharging! Summer vacation actually started five days early when our home was hit with a strange bug that included a high fever. My daughter’s classroom at school had been decimated by this bug! By my count, 9 out of 16 kids were hit with it, plus 2 moms…me, being one of them! In all my years of teaching, I never had a student miss the last day due to illness. Who misses the last day of school and isn’t on a plane heading to Hawaii?? My sweet Colin, that’s who! Lucy got it early in the week the last week of school, then passed it to Colin, and then me. The fever wiped us out but we never fully had a chance to recover before we were heading out of town for a wedding and to visit family up north. We kept a busy pace trying to squeeze in as much quality time with family and friends as we could in seven days before returning home and jumping right into all the summer fun of swim lessons, beach days, a sleepover and birthday parties! I got in the shower the other day (a place where I usually do my best thinking) and realized that I really hadn’t had meaningful conversation with God, beyond a “Thank you God for this food,” the whole day! My brain felt so scrambled and full of distraction that even with concentrated effort, alone, in the shower, I still couldn’t put together a related string of thoughts to pray! Have you ever had a similar experience? It was an important realization for me. 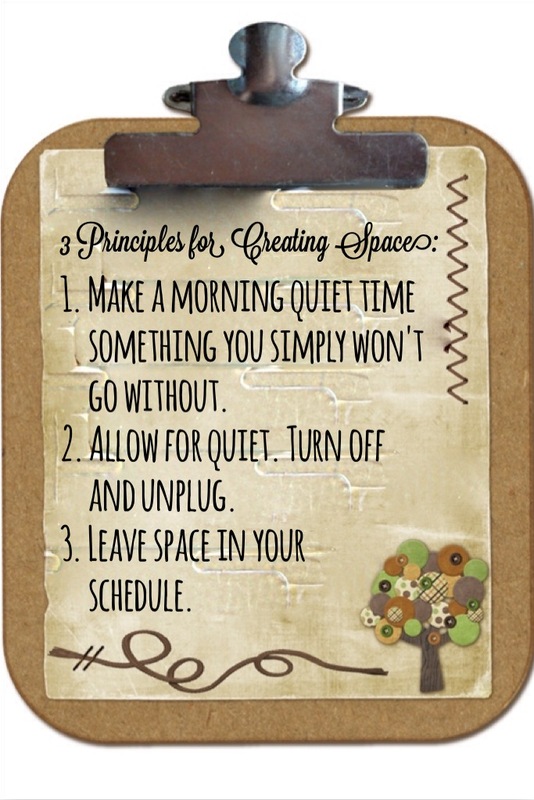 STEP #1 in my refresher course on the disciplines of the Christian life: CREATING SPACE. None of the other aspects of Christian living and growing to be more like our Savior can have any real impact if I don’t first create space in my life to experience a daily RELATIONSHIP with my Lord. One of the major pitfalls of the 21st century is we fill our lives SO FULL that I think my generation and beyond is forgetting (or never learning!) how to create purposeful empty spaces in our days. I’ll cover the first two ideas today and save the third one for tomorrow so I can go a little more in depth on that one. 1. Make a morning quiet time something you simply won’t go without. There are many people who absolutely refuse to start their day without a cup of coffee, or would never think to leave the house without makeup on…make time alone with the Lord just as vital to the start of your day! I’m a firm believer in this one. There have been seasons in my life (such as when I had babies not sleeping through the night) when time for Bible study and prayer just didn’t work well in the morning, and I had to carve out alternatives later in the day. However, as much as is possible, isn’t it best to begin our day with our Creator and Sustainer? If He is the one who kept me breathing all through the night and if He is to be Lord of my day, then doesn’t it make sense to begin my day in conversation with Him? 2. Allow for quiet. Turn off and unplug. There is no doubt that we have become tied to our devices. When my cell phone took a swim in the toilet (I’ll admit it…not once, but twice! ), the Lord convicted me. Do I really need to be so connected to my technology that I have to walk around my house with my phone in my pocket? I know I’m about to date myself, but just think for a minute what a difference 30 years has made. When I was a kid, our phone was attached to the wall. In the kitchen. My mom had to sit down at the kitchen barstool to talk on the phone. If the phone rang and we didn’t get to the phone fast enough, the caller had to try back at another time. No answering machine. There was no expectation on the part of the caller of being guaranteed to reach you. If it was important enough, the caller would have to come to the front door! Our world has become so noisy that we have to take steps to actually create quiet. For a certain period of the day, to allow time alone with the Lord, turn off the radio and TV. Turn off your ringers. 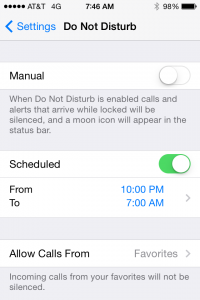 In fact, use the “do not disturb” feature on your phone. Have you tried it? It’s awesome! 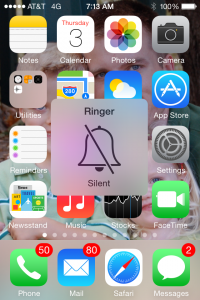 It will silence your phone from ringing, or even buzzing and vibrating, while still allowing certain phone number you have deemed as “favorites” to ring through in case of an emergency. 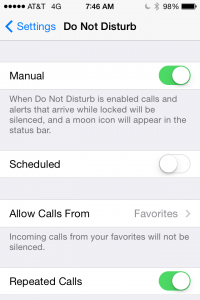 The “Do Not Disturb” feature can even be set to turn on and off every day at a certain time, then you don’t even need to think about it! My husband’s phone is set to go off during the hours between 10 pm and 7 am, but you could just as easily set the phone to turn off for an hour or so in the middle of your day. If allowing for quiet is a hard one for you, ask yourself why. Think about what your resistance to step away from the noise is based upon. Is it fear? Something important might happen in the world or to a loved one and I won’t know about it? My spouse/friend/employer expects an immediate response out of me? If there is an underlying fear, ask the Lord to give you His peace that He is in control and that He is bigger than even our technology. If there is a message that He needs you to receive, do you really think he has to use a wired device to deliver it? 3. Leave space in your schedule. As I mentioned, this one needs a little more attention and we are going to go right to the Source of all Sources to get some answers, so you will have to check back tomorrow! In the meantime, I want to hear from you! My list of ideas for creating space in our busy lives is just the tip of the iceberg. If I haven’t made this clear already, let me say it loud and clear now: I am right there in the trenches with you! The very fact that it has taken me weeks to get this post up tells you I’m preaching to my own heart. Creating space in my life for the important disciplines of the Christian life like Bible study, prayer, worship, and fellowship is a constant struggle. I’d love to hear your suggestions on finding this important balance. What helps you create space in your life for time with the Lord? This is awesome, Molly! I have missed your blog and I can tell you, I have surely missed blogging myself. Been so “busy” I have not set aside the time to get back to Hebrews! This is a great read for me this morning! Thanks for the practical info on how to turn off my phone!! There are only three people I need to hear from: you, Emmy, and Dad! So I can easily turn off this distracting and “essential” device! Love you and am so thankful for how the LORD speaks to you! I yearn for the days when that phone had a cord attached to a wall! Thanks for your faithful encouragement, Mom! It’s funny, but when I think of that phone on the kitchen wall, I think of you spending hours passing prayer requests down the phone tree for our church family and I remember all the times I would hear you praying over the phone with friends in need. Thank you for being such a wonderful model of a prayer warrior and starting me on my journey to help others have a passion for prayer as well! I love this reminder, Molly. It’s really true that meeting with the Lord in the morning makes such a difference. I need to discipline myself to make my morning quiet time a priority – even if it’s only for a few minutes. In this season of my life where I’m in my mid-40s with a toddler and a baby, I’ve struggled with not being able to leisurely (or what now seems leisurely) sit with my Bible and notebook. I’ve pared down to a quick Bible reading with commentary from the leader of women’s ministry at my church (www.gospelsinayear.com) and praying – even if I’m interrupted by my children. This isn’t a comfortable way to have my quiet time, but discipline is all it would take for me to make this time more meaningful each day. I was convicted when you reminded me that I don’t go to work without makeup on. It’s a good reminder that my time with God should not only happen every day, but be meaningful. Can’t wait for your next installment! This is a wonderful blog. It spoke very loudly to me. It’s amazing how I (speaking about myself) can schedule and prioritize everything else in my life. I make time for the kids games, meetings, lunch dates, even a scheduled TV show but when it comes to making time for the most important person in my life; the One who has my life in His hands, the One whose grace wakes me up every morning, provides for me, loves me unconditionally I can’t never make the time in the 24hours of a day that He has given me. I Need to rethink what is really important in my life. If my Heavenly Father is as important as I say he is, why is it so hard for me to make the time to be with Him.. My priorities are in the wrong places and instead of feeding my spirit which brings(life and peace), I’m feeding this carnal flesh(which leads to death and destruction).Thank you so much Molly for helping me to see myself in the mirror. I can no longer keep fooling myself thinking my relationship is good with God when I’m not spending time in His presence. I will never know His purpose for me if I don’t spend time in His presence.I will never know who I am in Him if I don’t spend time with Him. I will never receive His strength and power I need to defeat the enemy if I don’t spend time with Him. I will never experience His peace and joy if I never spend time with Him. will never experience His presence and will continue to feel I’m missing something because I’m not spending time with Him. Molly, I’m going to spend time with Him right now! P.S. I apologize to you and the readers for writing my thoughts out loud on your blog. It has really help me to see it written out. I’ll use a journal next time. I’m so glad the Holy Spirit led me to you. I have a lot to learn. until next time. Heidi, it is ALWAYS good to hear from you! I’m actually really thankful you mentioned the reality that time with the Lord will look different for us during different seasons. God will use and multiply whatever we can offer him – even if it is the equivalent of a few fish and a couple loaves! It might just be a few minutes before the distractions that we can’t turn off (such as needy little ones!) call us away, but when we are disciplined to make that time a priority, we will be blessed! I think mommies, especially, need encouragement that we aren’t missing the mark if we can’t have a structured, spirit-filled, bended-knee time of prayer, Bible study and worship every day! It’s all about the heart! 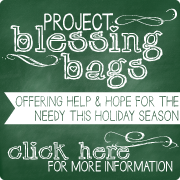 Bless you and your little ones!